I love traveling by myself because it means I can decide where I want to go, what I want to see, and how much time I want to spend on things without worrying about another person’s agenda. While traveling with friends and family is fun, it also brings extra challenges—if you can only go to Vienna once in your lifetime, the freedom to decide exactly what you want to do has its perks. You can sleep in as long as you want and pick the dinner restaurant every time—plus, you won’t have to compromise and miss something you cared about seeing because your traveling companions weren’t interested. While traveling alone is very rewarding, it does come with increased risk. If you’re planning a trip by yourself, choose your destination carefully and make smart choices while you travel. So, which cities in Europe are best for people traveling on their own? We looked for cities in peaceful countries with a high quality of life. We also evaluated public transportation options, local English proficiency, and attractions that would be fun to explore. If you’re planning a trip to Europe by yourself, we recommend visiting one (or more) of the following cities. It is easy to get around in Zürich. The city often shows up on lists of cities with the best public transit and cities that are easily walkable. This famous art museum is open Tuesday through Sunday, and visitors can see cubist paintings by Picasso, impressionist landscapes by Monet, and colorful Chagall paintings. It also has medieval sculpture and works from local Zürcher artists. Art museums are some of my favorite places to visit when I’m alone because I never feel out of place and I can spend as much time as I want looking at the things that are particularly interesting to me. 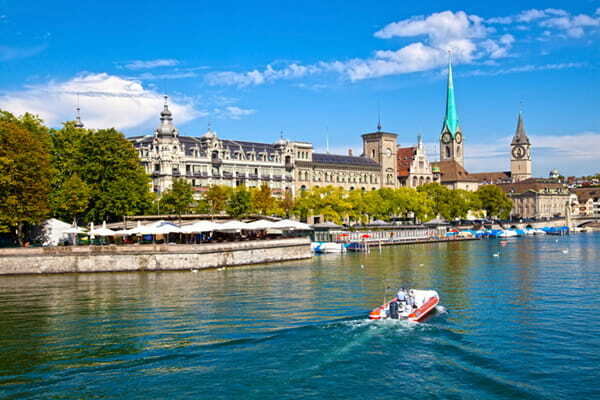 At the top of this mountain, you’ll see views of the city and Zürich lake. 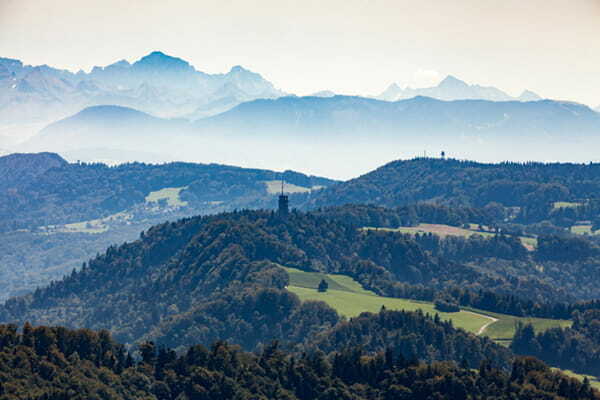 You can get to Üetliberg from Zürich’s main train station, or you can spend about an hour to hike up from inside the city. Once at the top, you can enjoy the sweeping view, go for a bike ride on the Triemli and Höckler bike trails, hike the famous Path of the Planets, or eat traditional cuisine and seasonal specialties at one of the restaurants. This world-famous shopping market has everything from high-end boutiques and chocolate shops to secondhand shops and local markets. If you like fashion you can check out a wide variety of stores from Louis Vuitton to Tommy Hilfiger. And if you’re more interested in sweets, you can visit speciality chocolate shops like Teushcer and Läderach. The public transportation system is efficient and makes it easy to get to tourist destinations spread throughout the city. 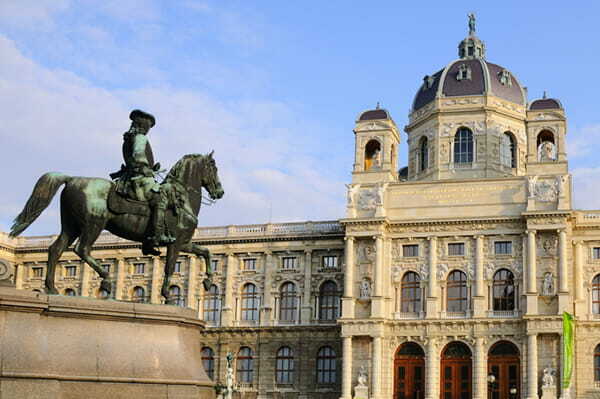 Vienna has many fascinating museums and historical sites to explore. 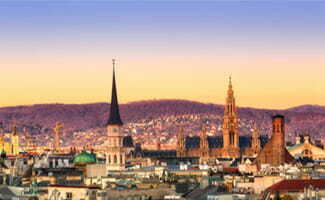 This UNESCO World Heritage Site is one of the biggest attractions in Vienna. Visitors can tour the palace and learn about historical figures, such as Maria Theresa, princess of Bavaria. You can visit the park by this palace for free, but it is worth paying a bit extra for entrance to some of the palace’s beautiful gardens. Some of the ticket options for the palace tour will also include entrance to the gardens. 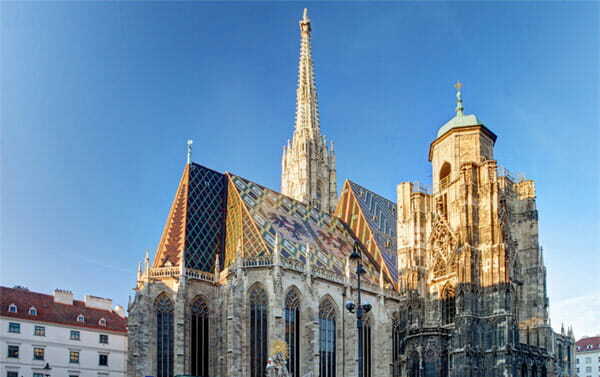 This cathedral is one of the best-known sights in Vienna. The building is stunning whether you view it from a distance or take a guided tour through the cathedral and accompanying catacombs. This museum is worth a trip just to see the beautiful historic building itself, but it is also a must-see destination for art-lovers and history-nerds alike. Visitors can see paintings by Vermeer, Raphael, Velásquez, and Rembrandt. A ticket also includes admission to the Collection of Ancient Instruments and the Collection of Arms and Armor in the Neue Burg. This section of the city sits along the canal. 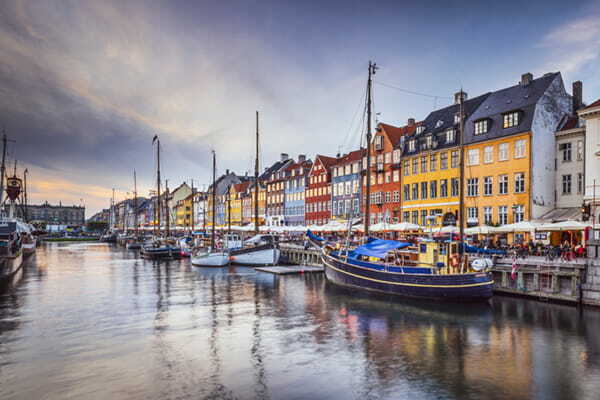 Visitors can take a boat tour of the canal, relax with a beer at a local café, or admire the colorful buildings (including previous residences of the famous fairy-tale author Hans Christian Andersen). You can see works by some of the best artists in the world at this popular museum. It contains a huge collection of antiques and sculptures as well as work from artists like Van Gogh, Cézanne, and Monet. You could spend just a few hours at the museum or set aside your whole day and get coffee and lunch at the museum’s cafe inside the lovely Winter Garden. This famous castle has a treasury with crown jewels, portraits of famous monarchs, historical furnishings, and beautiful grounds. It’s easy to walk to some of the most interesting sights in Prague from hotels in the middle of the city, so if you’d like you can get around without driving or using public transit. 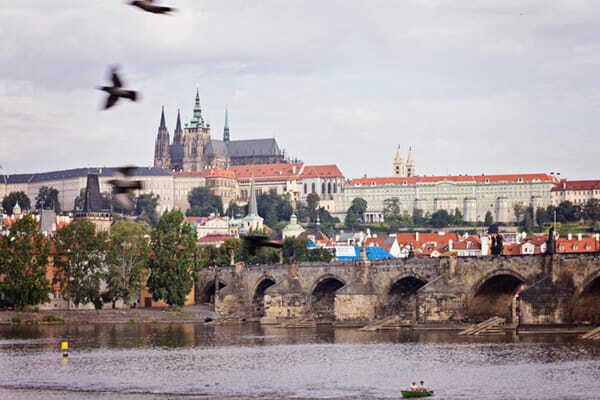 It would be a mistake to visit Prague without checking out the famous Charles Bridge. You can walk across it to get from the old town area to Prague Castle, so you can easily fit it in between other sightseeing destinations. There are also often local artists, musicians, and performers on the bridge, so you can get a great taste of local culture as you walk across it, whether you’re on your way to see Prague Castle or wandering the city in the evening looking for some of the delicious local Trdelnik pastries. This castle is actually a whole complex of fascinating historical buildings. Walk through the royal garden, check out the majestic St. Vitus Cathedral, or walk down Golden Lane and explore the smaller buildings where servants, marksmen, and goldsmiths lived. If you’re looking for a nice place to spend the evening, check out Old Town Square. You can eat dinner at an outdoor cafe when the weather is nice, try local pastries or gelato for dessert, watch street performers, or admire the famous astronomical clock. Sometimes it is nice to wander through a beautiful outdoor space without the crowds at major tourist attractions. 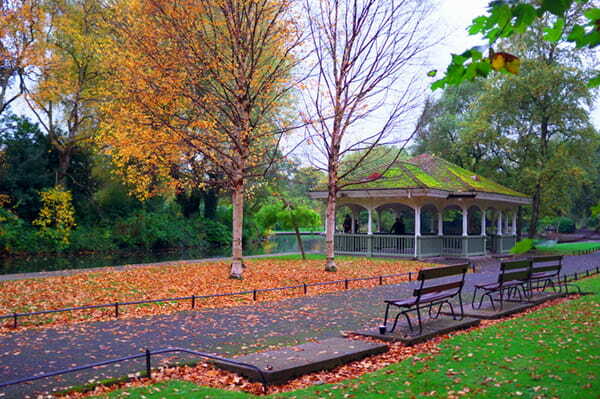 Letná Park is a pleasant place to walk around and interact with friendly locals. The park also offers amazing views overlooking the city and Prague Castle. It is a perfect place to end your day as the sun goes down and the city lights up. English is the primary language in Ireland, so it is easy for English-speaking visitors to navigate, order food, make reservations, and interact with locals. 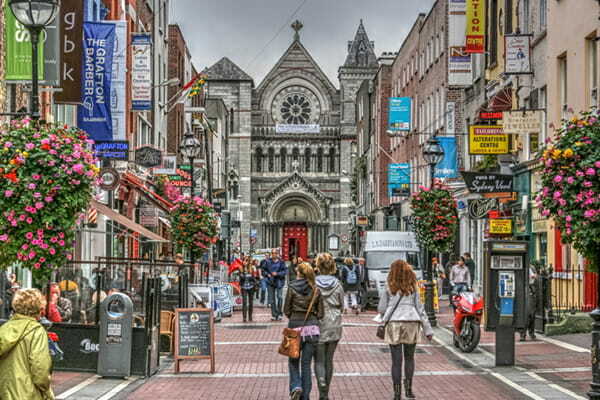 Tourists can easily walk around Dublin and see many of the most popular sights. Dublin is a short day-trip away from stunning sights like the Cliffs of Moher and Giant’s Causeway. Trinity College is one of the most famous old colleges in the world. 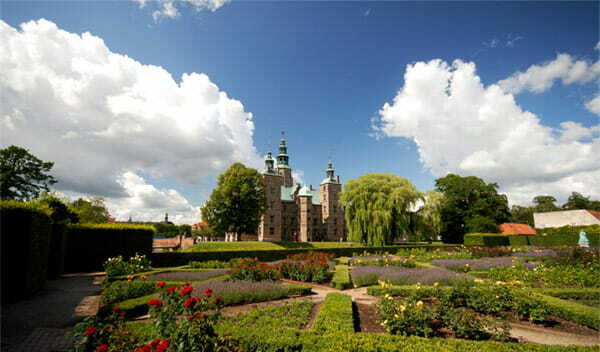 Walk around to enjoy the grounds and historical buildings. Or, if you love books, you can visit the famous Long Room of the Old Library with the Book of Kells and thousands of other antique volumes. This park sits at the center of the city and is a perfect place to relax outside and enjoy the local culture while staying near shops and restaurants. Ireland is world-famous for its alcohol, and if you’re interested you can visit the famous Guinness Storehouse or Jameson Distillery. We’d also suggest checking out the lesser-known and still-operating Teeling Distillery, where you get the chance to see how the whiskey is made and taste it for yourself. The places we’ve listed are all very safe, but there are things you should keep in mind when you’re traveling by yourself, no matter where you go. Pack smart. We suggest taking a money belt, power converter, secure bag, luggage lock, printed maps of your destination, and a portable charger. Tell someone at home where you will be and give them a loose itinerary of when you’ll be in certain areas. Set up times to check in with them through a phone call, email, or message so they know you’re okay. Research your destination before you go. We suggest looking into local laws and customs, public transit options, popular points of interest, weather forecasts, and current events in the area. Make digital copies of physical things and physical copies of digital things. Take photos of things like your passport and driver’s license. Print out hotel reservations, car rental paperwork, airline tickets, and any other documentation that you would want available if you couldn’t access your phone. Over-budget. You should never feel pressured to make a choice that diminishes your safety because you’re worried about the cost. Plan enough wiggle room in your budget to take a taxi if you don’t feel safe walking in a certain area, switch to a nicer hotel if yours doesn’t seem secure, or buy a plane ticket if your plans suddenly change. Split up your money. There are many places in Europe where it is pretty common to use cash instead of a credit card, but you should avoid carrying too much cash when you head out for the day. Keep some money secure in your hotel room and some with you while you’re out sightseeing. Keep the essentials on your person. You might carry a purse or backpack while you’re exploring a new city, but make sure to keep certain items in your pockets or in a money belt—that way, you won’t get stranded without your hotel key, cash, or phone if your bag gets lost or stolen. Avoid drawing attention to the fact that you’re a tourist. Dress like a local when possible, avoid carrying a huge expensive camera everywhere you go, and pack light—especially on days when you’ll be seeing lots of sights. Know your limits when you drink. Trying out the local whiskey, wine, or beer is a fun part of getting to know a new place, but drinking also interferes with decision making. Make sure you drink only in situations where you feel safe, and drink less than you would if you were out with friends back home. Plan ahead to avoid risky situations. You don’t have to plan your trip down to the minute, but planning ahead a little can help you stay safe. Give yourself enough time to get back to your hotel before dark, look up your route before you walk somewhere so you can avoid getting lost and stay on well-lit streets, and make sure you are alert enough to stay awake whenever you take public transit. Tell your bank and credit card company that you’ll be traveling. Having access to your bank account is essential when you’re traveling—especially if you’re alone. If your credit card company knows ahead of time that you’ll be out of the country, you’re less likely to have problems with a card being declined when you need to make a purchase. Get international coverage for your cellphone. Cellphones are very useful tools for travelers, but only if they work. Contact your carrier to set up international coverage while you’re traveling. You will probably be charged extra for this service, but we believe the benefits of being able to use your phone outweigh the cost. Register your trip with the US State Department’s Smart Traveler Enrollment Program (STEP). Travelers who have enrolled will get information about safety conditions in the country they’re visiting. This program also helps the US embassy contact you if there is an emergency back home. The following cities didn’t make our top five list, but they’d all be pretty safe places for smart solo travelers to visit. Traveling alone allows you to set your own schedule and prioritize the things you want to see most. It also gives you a chance to get to know yourself and a new place in a different way than you would if you were traveling with friends or family. Choose your destination carefully and make smart decisions while you travel so you can fully enjoy exploring a new place while staying safe on your own. What cities in Europe would you like to see? Are there any that you want to explore on your own? Share your ideas in the comments below!